Artificial intelligence is already everywhere, and its influence is growing. It can be hard to get your head around exactly what AI does and how it can be deployed though, which is why we present to you these five fun online experiments—all you need is a web browser and a few minutes to see some of the party tricks AI is already capable of. How does it work? 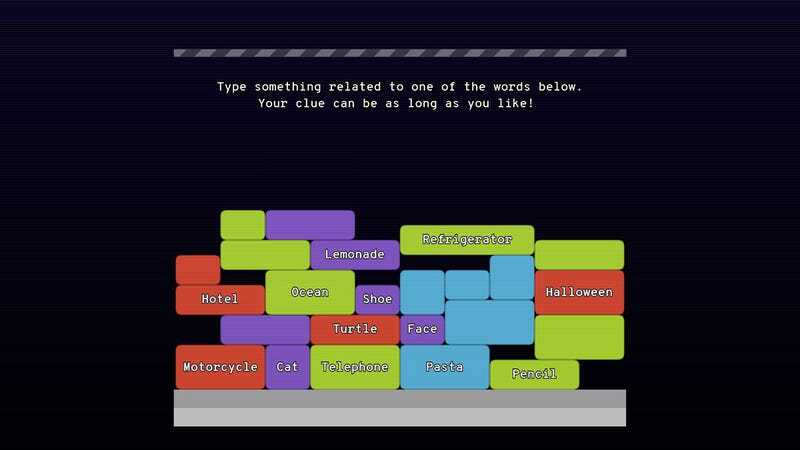 Be wary of loading this one up unless you’ve got a bit of time to spare today, because it can be particularly addictive: The idea is to remove blocks from a wall by typing out definitions that Google’s AI can recognize. Using machine learning algorithms, Google engineers have trained Semantris on billions of lines of sample dialog. By picking up associations between words, that should give the engine enough training to spot which word in the wall you’re trying to define—though it can come up with some unexpected guesses. Google recommends “playing with slang, technical terms, pop culture references, synonyms, antonyms, and even full sentences” to try and get Semantris to understand what you’re saying to it. What does it do? Creates artificial faces of people who don’t actually exist, using AI. Who made it? Uber engineer Philip Wang, on top of a generative adversarial network (GAN) developed by Nvidia’s AI team. How does it work? These faces don’t come out of thin air—they’re based on a database of training photos. What the GAN does is pit two neural networks against each other, the first to generate a fake face, and the second to judge if the face is realistic enough (based on all the real faces it’s seen). This feedback loop repeats and repeats until a face is produced that could pass for an actual person. The most recent breakthrough—and what helps make these faces so creepily real—is the way different aspects of the face can be handled and tweaked separately, then blended together into a cohesive whole. That means completely new faces can be generated from bits of existing ones more seamlessly than ever before. Nvidia is using similar AI engines to produce fake pictures of cats, bedrooms, and motorcars. What does it do? Turns your amateur scribbles into polished line drawings. Who made it? Google and a talented team of artists. How does it work? AutoDraw is like AI’s take on Pictionary—it looks at your rather haphazard drawings on screen and then tries to recognize what you’re trying to sketch out, replacing your efforts with something much more professional. At the heart of AutoDraw is some impressive machine learning: Your drawing gets compared against a vast database of images to try and find a fit, and it’s the AI that enables matches to appear so quickly from so little information. Note as you add more and more detail, the suggestions along the top get more and more accurate. That’s the power of AI algorithms at work—using a training model of what a cat should look like to recognize when you’re trying to draw a cat, even if the engine hasn’t seen your precise combination of strokes and squiggles before. What does it do? Carries on sentences using AI from your initial prompts. Who made it? Kevin Kwok, Guillermo Webster, Anish Athalye, and Logan Engstrom. How does it work? Writers are by no means safe from the rapid rise of artificial intelligence, as Cyborg Writer proves—it uses an artificial neural network to finish off your sentences in the style of William Shakespeare, the US Supreme Court, David Foster Wallace, Wikipedia, or numerous other options. Use the drop-down menu at the top to pick your style, and the Weirdness slider to adjust how crazy the linguistic freestyling gets. Then, start typing out a sentence and hit Tab to have the AI finish off your sentence for you. If you do end up writing a best-selling novel or a hit play, remember to give the machine learning engine TensorFire co-credit. Again, the whole system is based on a trained model that’s then used to predict the most suitable response to what you’re typing, based on vast libraries of previous samples. It’s TensorFire and TensorFlow that makes the whole process so fast though, and able to run lightly in your browser without any extra software. What does it do? Gives you a natural language response to a question. How does it work? Sometimes the Google search engine can’t answer your questions... what is love? Am I dreaming? How can I finally stop thinking and fall asleep? That’s where Talk to Books comes in. In short, it’s designed to predict what a natural response to a question would be if it was actually conversing with you. To do this, it’s been trained on text in over 100,000 books. Machine learning is used to rapidly sift through many different possible responses to find the most likely and appropriate one—it’s a lot of fun to play around with and can come up with some really intelligent responses. Try some of the sample questions to get a feel of what’s possible. You can ask about the smartest characters in Harry Potter, for example, or ask how to write poetry. Talk to Books then picks out sentences and passages that match its response model the closest.